Last Thursday (November 30) I got a notification about an upcoming event – the Billboard Women In Music 2017. It was to be live streamed on Twitter from The Ray Dolby Ballroom at Hollywood & Highland Center. Usually I don’t like such events as they are often full of artificial happiness, pompous speeches, over-the-top fashion and visual effects … and in general only a mediocre entertainment. I am not sure what made me click on the Twitter link to the show, but I am happy I did. As it panned out, this event was different. Maybe it was because there was no any television channel involved, so no demands of a typical broadcasting had to be accepted. So it felt more civil, more human and thus more real. Not that there were not included typical attributes of a televised pop-culture show. There were extravagant costumes, red carpet (or as some called it a pink carpet) interviews, or the media people craziness at photo opps. But one thing was palpably missing – hyperinflated egos. The popular music got a lot of beating in the last almost two decades. And it is just starting to recover from the post-Netflix slump. But that doesn’t mean at all that there is humility prevailing on the music charts, shows and stages. What made this Billboard show different, was that it was strictly about women … obviously. And one could feel it. Throughout the initial ‘red carpet’ interviews and also from acceptance speeches by the honourees, most of the time one could perceive real human beings in those young ladies and music stars. There was a lot of giggling, and also real laughs on one side, but also some tears on the other. Simply – they were believable. Such a difference from the ‘plasticky’ MTV Euro Music Awards from London, three weeks earlier. There was also another aspect that caught my attention that evening. In the era of growing scandals of sexual harassment everywhere, there is no way to hide the fact, that women have it harder to succeed in the male dominated entertainment world. But this flock of young music artists exuded pride, dignity, civility and emotionality, that very few of their male counterparts would be capable to compete with. And the industry is already changing and popular music with it. That should had been obvious to everyone watching this Billboard event. Could you imagine only a couple years back to have a thirteen-years old girl singing and playing ukulele on a stage like this? And Grace VanderWaal proved that the Rising Star Award was in the right hands. Camilla Cabello accepted her Breakthough Artist Award and confirmed the growing power of the Latin music. Other honourees were Mary J Blige, Kelly Clarkson, Kehlani and Solange. 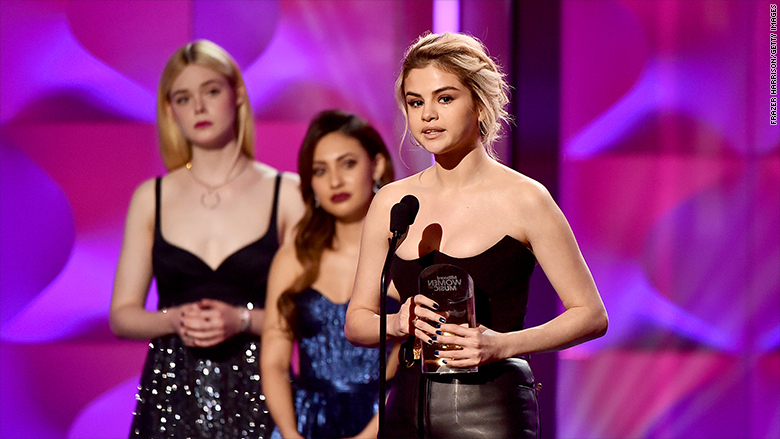 The main award, the 2017 Woman of the Year finished in the hands of Selena Gomez. And she confirmedagain the feeling I am trying to describe here. These successful women are mindful of their music, of their career, their supporters and audience. They are changing the popular music and writing a next chapter in the music history.